From the North: Garden State Parkway South to Exit 105 onto Route 36 East. Go 3.5 miles to 7th traffic light, turn right onto Broadway. Follow Broadway east to Ocean Blvd. 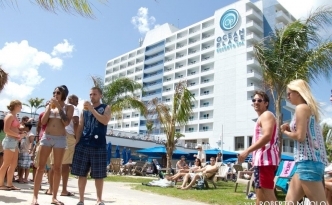 Oceanfest is located on the Promenade Boardwalk between Pier Village and Seven President’s Park. Alternate Route: Garden State Parkway South to Exit 105 onto Route 36 East. Approximately 3 miles bear right onto Monmouth Road, Highway 71. Follow Monmouth Road for three lights, stay in left lane and continue onto Cedar Avenue. Follow Cedar Avenue to Ocean Avenue, make a left and continue North approximately 2.4 miles to Pier Village. Oceanfest starts on the Promenade Boardwalk just north of Pier Village. From the South: Garden State Parkway to Exit 105 and follow directions above. From West NJ and Philadelphia area: Come east on Interstate 195 to Garden State Parkway North. Get off at Exit 105 and follow directions above. We suggest parking in any of the paid lots along Ocean Boulevard, the parking garages in Pier Village and there is on the street parking along Broadway and Second Avenue.